A lot of shoe users appreciate the lightweight comfort of the Vans SK8-Hi Pro despite its high-top profile. Most wearers admire the kick's high silhouette as it provides ankle protection and support especially when skateboarding. A few skaters attested to this and shared that the shoe saved their Achilles from being injured by the board. People use this kick for skateboarding, BMX riding, and longboarding due to the outsole's excellent grip on pedals and board grip tapes. Majority of the purchasers were pleasantly surprised with the addition of the Ultracush HD insole as it provides an enhanced in-step comfort. A significant number of loyal Sk8-Hi fans expressed their fondness with the classic Vans kick and added that it has grown with them and suited them no matter their age. The Vans Sk8-Hi Pro is available in a variety of colorways. A number of skaters and casual users of the shoe noticed the pair's more durable construction thanks to the Duracap underlays added to this Pro model. A higher number of consumers shared that the shoe fits as expected. An overwhelming majority of reviewers applauded the pair's stylishly classic design. Some fashion-savvy customers liked how easy the pair is to match with a multitude of casual ensembles. The shoe can be dressed up or down. 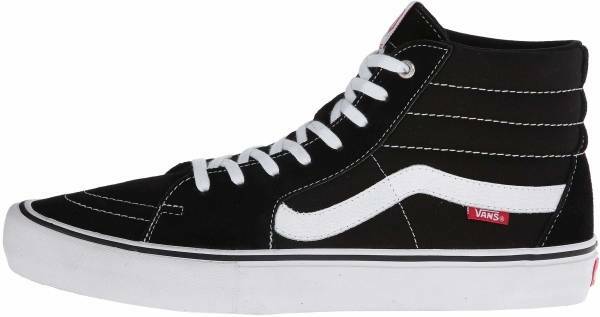 Offered at $70 a pair, the Vans Sk8-Hi Pro costs a couple of bucks more than the non-pro version, which some buyers deemed to be worth it as this model offers enhanced comfort and durability, and remains relatively cheap when compared to other sneakers. A handful of wearers found the shoe difficult to put on and take off due to its high-top profile. Some shoe users noticed that the shoe's color, especially the red colorway, bled. A number of purchasers disclosed that the shoe fits them a half size too big. The classic SK8-Hi silhouette receives a couple of upgrades in the form of the Vans SK8-Hi Pro, which aims for longevity and enhanced performance on the board. As its name implies, this model's improvements are based on the demanding sport of pro skateboarding that involves repeated stress and blows when perfecting a trick. This kick now incorporates the brand's Ultracush HD insole and Duracap underlays for enhanced comfort, impact protection and durability – two essential features that the original version seemed to lack. As per the well-documented history of Vans, it is known that the brand had unintentionally attracted a skateboarding clientele due to their waffle outsole's excellent grip. And from there helped cultivate the culture by providing footwear that caters to the demand of the sport. Although not as technologically advanced as its peers, Vans prides itself on a couple of time-tested styles that are still a favorite even to this day. One of these styles is the Sk8-Hi, which was officially launched in 1976 as the "Style 38." The SK8-Hi's story starts with its sibling, the Old Skool, formerly known as the "Style 36." The Old Skool's leather and canvas upper were purposefully made to put up with the wear and tear of skateboarding. Skaters took the release of the Old Skool as a big deal, but something was still missing: ankle protection. The company released the Style 37, a mid-top skate shoe, to fulfill the missing piece but it wasn't enough. Therefore the SK8-Hi Pro was conceived, a high-top skate shoe that retained the Old Skool's leather and canvas construction and rubber outsole but with a taller profile that provided ample ankle protection and support. Today the SK8-Hi has been reinterpreted in countless ways without messing with the original construction too much. The kick has been released in a slimmer version, an all-weather version, and innumerable colors and prints – all donning the classic style of the original. One of these many reinterpretations is the Vans SK8-Hi Pro, which features upgrades for a longer lasting built and enhanced protection and comfort while you dominate a skate sesh. Initially designed with skateboarding in mind, the SK8-Hi range has successfully crossed into the lifestyle arena thanks to its simple and classic aesthetic. The shoe exudes a retro, cool vibe that remains not only classic and relevant no matter the trend but is also easy to style with a wide array of outfits. Its high-top silhouette combined with stylish colorways could enhance a rather boring ensemble. Today people are seen pairing it with crop, tapered pants to showcase its high-top design matched with a t-shirt and cap for a streetwear inspired look. It could also be dressed in leggings, shorts, skirts or dresses for the ladies or joggers, jeans, or walking shorts for the guys. The Vans Sk8-Hi Pro is a unisex shoe that is available in men's sizes that range from 6.5 to 13 and women's sizes that range from sizes 8 to 14. Although majority have found this kick to fit true to size, several buyers noted that it tends to run big and recommended going half a size down. Ultimately, fitting the shoe in person is best advised. The Vans Sk8-Hi range has been on the market for decades and has purposefully remained faithful to its classic style. The Vans Sk8-Hi Pro adopts the original's time-tested design and elevates consumer experience by adding Ultracush HD insoles and Duracap rubber underlays. Aside from these upgrades, the kick's top-most lace eyelet can distinguish the Sk8-Hi Pro from the original version. The Sk8-Hi Pro's top-most eyelet is made of metal while the original version displays a punched eyelet hole. This kick comes with an extra pair of laces. The Vans Sk8-Hi Pro also comes in a number of collab versions that includes Thrasher, Supreme, and Scotty Cranmer.